This year’s ordination class is largest in U.S.
Brooklyn’s Roman Catholic community filled its large, newly-consecrated St. Joseph’s Co-Cathedral to standing-room capacity on Saturday, June 28, as the Most Rev. 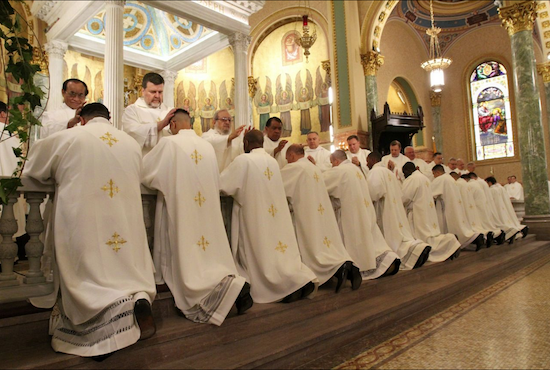 Nicholas DiMarzio, bishop of the Diocese of Brooklyn, ordained 13 men to the priesthood. This year’s ordination class is the largest of any Catholic diocese in the United States. More than 1,500 attendees and 200 vested priests attended the multi-lingual liturgy. The Scriptural readings were proclaimed in several languages, including Creole, Polish, Spanish and Italian. Bishop DiMarzio individually laid hands on the head of each new priest as part of the ordination rite. Afterward, all the vested priests present went to the altar rail to lay hands on the newly-ordained priests. Bishop DiMarzio then anointed the hands of each priest and handed each a chalice and paten to celebrate Mass. The new priests each had the chance to celebrate their first Mass in their home parishes, or the churches in which they’ve been serving as seminarians and deacons. The blended congregations of Fourth Avenue Presbyterian Church and Bay Ridge United Church bid Godspeed to Pastor Jane Donnelly on June 29, on the occasion of her honorable retirement from ministry. Pastor Donnelly has served Bay Ridge United Church since 2005, and was installed as pastor there on May 16 of that year. Faced with declining membership, Bay Ridge United Church was determined to continue its ministry and entered into dialogue with the Fourth Avenue Presbyterian Church, which sits at the border of Sunset Park and Bay Ridge, half a block north of Bay Ridge Avenue. Fourth Avenue Presbyterian Church, which is historically an Arab congregation and the home of the Syrian Protestant community in Brooklyn, has grown and today is diverse in its membership, with congregants from as far away as Egypt, Palestine, Norway and Puerto Rico and as near as Brooklyn. The church became famous after the August 2007 tornado that blew out its stained-glass windows, which have since been repaired. This past February, Fourth Avenue Presbyterian Church and Bay Ridge United Church held the liturgy that integrated them into one congregation. Since then, Donnelly has been co-pastoring with the Rev. David Aja-Sigmon and helping with the transition to her retirement. Pastor Aja-Sigmon has been the pastor of Fourth Avenue Presbyterian for many years. This past Sunday, the integrated congregation took part in the Dissolution of Call liturgy. St. Ann & the Holy Trinity Church welcomed two new staff members this week: Deacon Katherine Salisbury and Matthew Leaycraft. Between them, Deacon Kate and Matt have years of experience in ministry. Both will serve the Episcopal parish at St. Ann’s in a part-time capacity. Bishop Lawrence Provenzano of the Episcopal Diocese of Long Island recently ordained Salisbury to the transitional diaconate, Fr. John Denaro, rector of St. Ann’s, announced. Matt Leaycraft will serve St. Ann’s as parish life associate while pursuing ordination in the Episcopal Diocese of New York. He is seminary-trained and, most recently, he served as a parish intern at the Church of the Heavenly Rest in Manhattan. Earlier this year, the parish had to lay off two staff members, including much-beloved music director Gregory Eaton. A third staff member, the Rev. Sarah Kooperkamp, had completed the terms of her first post-ordination curacy and Bishop Provenzano had redeployed her, following her maternity leave. Plymouth Church invites the community to get an early start on Sundays. Summer worship services began at 10 a.m., effective July 6, and continue through Labor Day. The Catholic Press Association of the United States and Canada recently honored writers and editors from the Brooklyn Diocese’s publications, The Tablet and Nuestra Voz, at its annual media conference in Charlotte, N.C.
Catholic Press Association, which represents more than 600 church-related media organizations in the U.S. and Canada, presents these awards annually. The website for the diocese’s Spanish-language newspaper, Nuestra Voz (nuestra-voz.org), won second place for Best Newspaper Website. Nuestra Voz took second and third place for Best Editorial, for columns written by contributor Mario J. Paredes and editor Daniel Alvarez. Nuestra Voz also received two Honorable Mentions, in the General Excellence category; and in the Individual Excellence category for columnist and writer Cruz-Teresa Rosero. St. Gabriel’s Episcopal Church Senior Center focuses on the importance of eating well. The church has announced, through Brooklyn Congregations United’s social media pages, a Healthy Eating/Cooking Demonstration taking place on Thursday, July 10. St. Gabriel’s is at 331 Hawthorne St. The presentation starts at 2:30 p.m. For more information, call 718-287-4334, or email [email protected].